Seventy years ago today, on a sleepy farm near Devon, Leduc No. 1 struck a rich deposit of oil and forever changed the course of Alberta history. The ground rumbled when grease-covered roughnecks opened creaking valves, and a mix of crude oil and gas spewed flames 15 metres into the air. Seventy years ago Monday, on a sleepy farm near Devon, Leduc No. 1 struck a rich deposit of oil and forever changed the course of Alberta history. The anniversary was celebrated during an open house Monday at the Leduc No. 1 Energy Discovery Centre, just south of Edmonton on Highway 60. On that chilly February morning in 1947, no one was expecting success. Least of all rig supervisor Vern Hunter. "It was a little exciting all right but it really didn't hit us," said Vern Hunter's son, Donald, who was 11 years old at the time of the discovery. "We'd had so many disappointments. We were afraid this would be another one." There was good reason for pessimism that morning. Imperial Oil had a dismal track record. The company had drilled 133 dry holes in a row, and after pouring millions of dollars into the search was about to abandon oil exploration altogether. Leduc No 1, about 15 km west of Edmonton and more than 80 km from any previous drilling sites, was one of six "last chance" wells for the company. Vern Hunter had a hand in so many of those failures he'd earned the unwelcome nickname "Dry Hole." "My father, he'd been wildcatting in Saskatchewan and southern Alberta all during the war," Donald Hunter of his father's early career. "So we spent three and half years basically in Saskatchewan drilling for oil and finding nothing." Preliminary drilling at the dusty farm suggested they might have struck something big, and Hunter was under pressure to name a day for the well to be brought in. He later stated: "The crew and I were experts at abandoning wells but we didn't know much about completing them. I named February 13 and started praying." By mid-morning on Feb. 13, some 500 spectators, including local farmers, residents of Edmonton, journalists, executives, government officials and politicians had gathered outside. It took Hunter's crews much of the day to fix frozen machinery. At around 2 p.m., a gush of mud finally gave way to a spout of clear, light crude. "Most of us, even my dad, didn't know how big it was," Donald Hunter said in an interview with CBC Radio's Edmonton AM. "The headquarters did, because they had the seismic, but we didn't." He said the importance of the well wouldn't hit home until the population started booming, and big investment dollars started flowing into the once sleepy farming town. "Finally, when they started drilling enough wells that they built the town of Devon, and when we moved into a house with running water, that's when it really hit us. It was just like we went to heaven," Hunter said of childhood in Leduc. "That's when it really hit everybody, and it mushroomed from there." 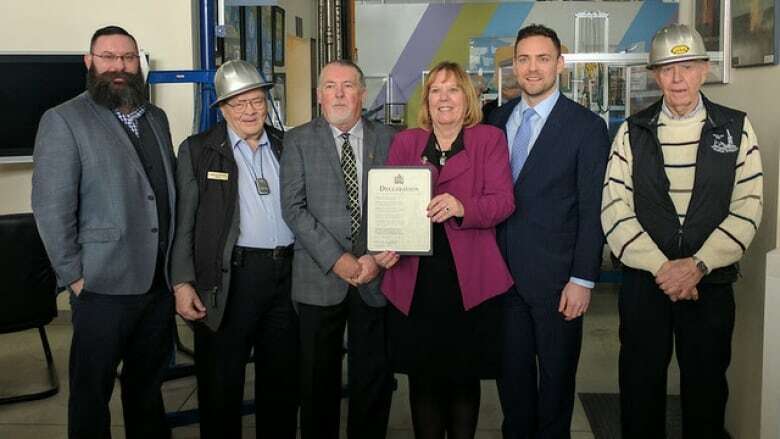 On Monday, Hunter stood alongside MLAs and oil executives as the province celebrated the 70th anniversary of the discovery and declared Feb. 13 Oil and Gas Celebration Day. 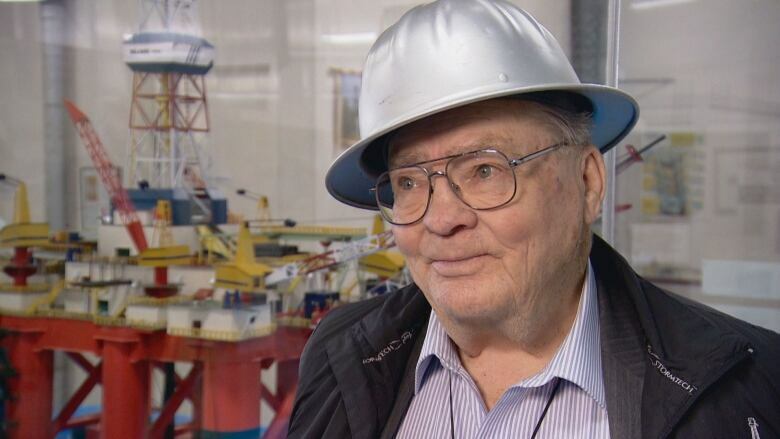 The discovery was, in many ways, the catalyst for modern Alberta, said Mark Scholz, president of the Canadian Association of Oilwell Drilling Contractors. "It's an opportunity to celebrate the contributions of so many men and women who work day in and day out, often in -40 C weather to produce some of the most responsible oil and gas anywhere in the world," Scholz said. Energy Minister Margaret McCuaig-Boyd said she can't imagine what Alberta would be like today without the discovery near Leduc 70 years ago. McCuaig-Boyd said the industry has been crucial to her family for three generations. "We as a government and we as Albertans appreciate the industry and know the value they bring to our province," she said. "It really isn't a partisan issue, it's important to all of us." Dan Claypool worked on the Leduc No. 1 well site shortly after it's discovery, and enjoyed a long career in the industry. He'll never forget the long days spent outside in -40 C weather, but it was all worth it for the 90 cents an hour he earned — a big wage at the time, he said. Claypool said he's honoured to have been a part of Canada's history, and in teaching future generations about the oil industry. "It makes you very proud, because a lot of people like myself, it has given them an entire career. So it shows you what it did for not only Alberta but all of Canada." The Leduc No. 1 discovery found oil trapped in what became known as the Nisku Formation. It led to numerous major discoveries across the Prairies, and triggered a mass migration of workers to Alberta. Before Leduc No. 1, more people lived in Saskatchewan than Alberta. Afterward, Edmonton and Calgary saw their populations double within a few years. Alberta was on its way to being an energy superpower. "You couldn't get a hotel room … roughnecks were living in granaries, and even the energy regulators from the government had no place to live. So Imperial Oil lent them a skid shack. It was crazy, trucks were coming and going day and night on the highway." "It was the greatest economic event to ever happen in Canada. It was really a boom."